Yes I have done it, buffalo chicken, in an eggroll. I’ve made these several times, and used different hot sauces each time. One time I used Sriracha, another time I used Franks, and even used Louisiana hot sauce. All are great. My husband prefers Franks. I think I liked the Sriracha the best. But they were all amazing. I also included lots of celery, carrots and green onions in these eggrolls. I serve them with creamy blue cheese. They are so good, and a fun new spin on buffalo chicken. 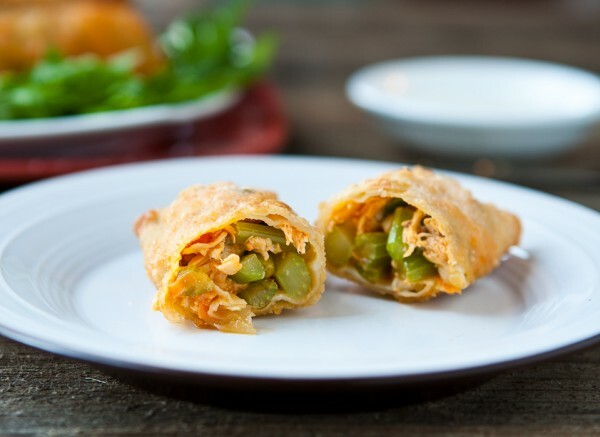 You can find the step by step photos for these buffalo chicken eggrolls over at Betty Crocker. In 2-quart saucepan, heat broth and water to boiling; add chicken. Reduce heat to medium; cook 20 to 25 minutes or until juice of chicken is clear when center of thickest part is cut (at least 165°F). Remove chicken to large bowl; set aside to cool. Discard poaching liquid. In 10-inch skillet, heat 1 teaspoon oil over medium heat. Add celery, carrots and salt; cook and stir until vegetables are crisp-tender. Shred chicken with 2 forks. Add sautéed vegetables, onions, pepper sauce, butter and blue cheese; mix well. In deep fryer or 4-quart Dutch oven, heat 3 to 4 inches oil to 350°F. Meanwhile, sprinkle work surface with flour. Place 1 egg roll skin on work surface with 1 corner facing you. (Cover remaining skins with damp paper towel to prevent drying out.) Place about 2 rounded tablespoons chicken mixture slightly below center of egg roll skin. Fold corner of egg roll skin closest to filling over filling, tucking point under. Fold in and overlap right and left corners. Brush remaining corner with beaten egg; gently roll egg roll toward remaining corner and press to seal. (Cover filled egg roll with damp paper towel.) Repeat with remaining egg roll skins and chicken mixture. 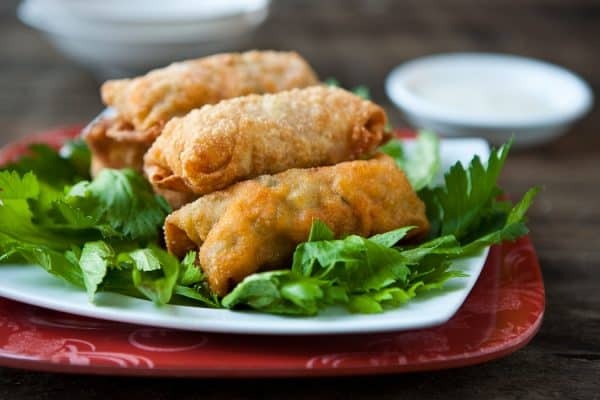 Fry egg rolls, a few at a time, in hot oil 4 to 6 minutes, turning once, until golden brown. Drain on paper towels. Place egg rolls on parsley-lined serving platter. Serve with blue cheese dressing. 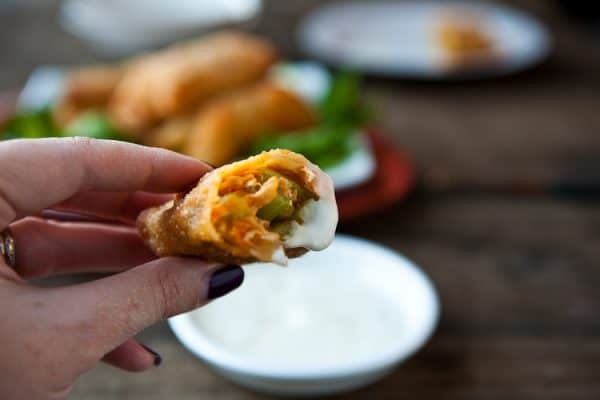 Buffalo chicken in an eggroll? This is my dream appetizer. LOVE IT! WHAT?! I must try these immediately! We love buffalo heat. This is a must!